A government issued photo ID is required by all prospects interested in touring. What are your move in fees? $50 application fee per applicant, $300 Reservation Fee/Annual Amenity Fee, and $500 Security Deposit. Your security deposit is refundable provided that there is not past rent owed and/or if there are not any damages after you move out of your apartment. You may break your lease however our policy requires for you to submit a 60 day written notice of intent to vacate and pay a termination fee of one month. Yes, once you have completed your first lease term, you will have an option of a month-to-month lease. After your first lease is complete you will have the option of month to month. We can also put you contact with corporate housing providers. Yes, all residents must provide renters insurance with 100,000 in personal liability coverage. Our units are unfurnished, however we can provide you with information for furniture rental or corporate housing. Yes, we can get you in contact with corporate housing providers we work with. If it is an emergency, please call the office. If after hours, you may leave a message in the emergency mailbox. For regular maintenance, you may speak to office staff to submit, leave a message, email office staff, or go to the property website and submit. The 6th of the month. You may have your bank mail a check to our office for rent payments. Any persons staying longer than 14 consecutive days will need to be added to your lease agreement. We offer carport parking spots for $35 a month. You may park your motorcycle in our regular parking spaces. You may install a satellite dish on a tripod on your patio. It may not be in any common area or attached to the building. Yes, you may choose between Verizon Fios or Cox Cable. Yes, our fitness center is available 24 hours a day. Yes, we have a beautiful swimming pool surrounded by a spacious sundeck. Each apartment home has additional outdoor storage on their patio/balcony areas. DIRECTIONS: I-66 west to Route 50 West. Take the second exit for West Ox Road. Make a right on Fair Lakes Parkway. Our property will be just up on the right. Arbors at Fair Lakes has set the standard for luxury apartment living in Fairfax, VA. Experience the convenience of our ideal location in Fair Lakes, VA. Nestled in a tranquil, wooded enclave that is just steps from such popular shopping and dining destinations as the Fair Oaks Mall & Fairfax Corner, you will never be more than a few minutes from everything you desire. Enjoy how easy it is to walk to Whole Foods or stroll through the stores at the Fair Lakes Shopping Center. Our Chantilly, VA apartments are perfectly situated near the refreshing tranquility of Burke Lake Park and the best that Fairfax has to offer! Residents of our community will love the easy access to I-66 & Route 50 and the advantage of a complimentary shuttle to the Vienna Orange Line Metro, making for an easy commute. Whether you enjoy relaxing by our refreshing pool, playing with your dog at our bark park, or enjoying our clubhouse with Wi-Fi, our luxury community has the high-quality amenities you desire. If you are looking for a one, two, or one bedroom with a den Fairfax, VA or Chantilly, VA apartments, see for yourself how our community combines the beauty of nature and the convenience of urban Fairfax, VA apartment living. 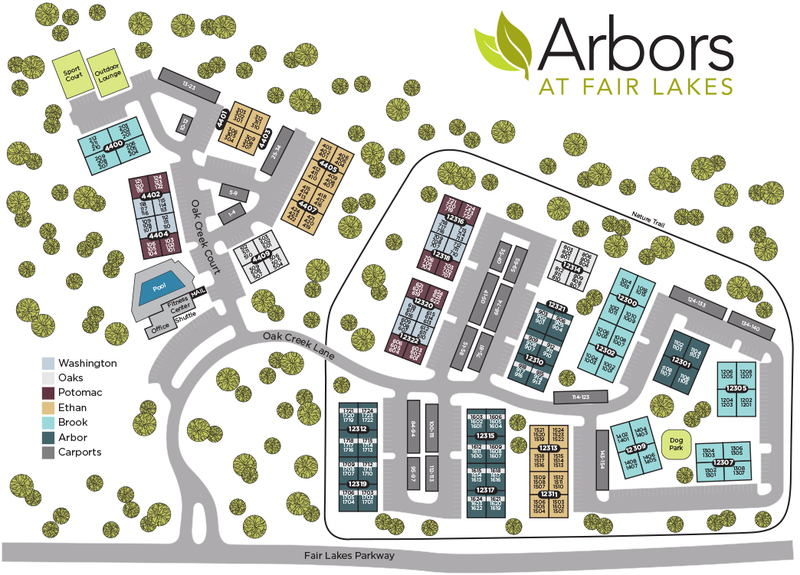 Schedule a tour of Arbors at Fair Lakes today. Love where you live. Come home to Arbors at Fair Lakes Apartments in Fairfax, VA.